Laguna Beach High School varsity basketball player Adam Armstrong in action against Calvary Chapel, a 54-43 home victory Wednesday, Jan. 11. Photo courtesty of LB Basketball boosters. A reduced seven-player Breakers squad was no match for Santa Fe as the Chiefs ran past Laguna 56-22 on Monday, Jan. 16. Charlie Rounaghi hit a three-pointer early in the game, but Santa Fe scored 19 straight to take control of the contest played at Costa Mesa High School. Laguna was scoreless in the final period for only the third time in school history. For the game, Laguna only scored eight baskets in the contest, six of them from beyond the arc. School scoring record holder Blake Burzell and player Owen McMurray did not participate because of team rule violations, a sanction imposed by Coach Bret Fleming. A third player, Adam Armstrong, was absent from Monday’s contest for unrelated reasons. The Breakers went 1-1 to start league play last week, defeating Calvary Chapel 54-43 at home on Wednesday, Jan. 11. Charlie Rounaghi scored 22, Grady Morgan 17, and Greg Potratz 11 as the Breakers hit for 11 three-point shots to overpower the Eagles. 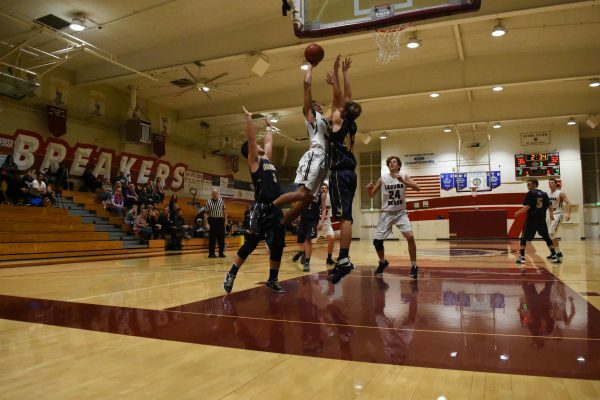 Last Friday, Jan. 13, the Breakers ran out of gas in the final period as Godinez (17-3) outscored them 22-9 to take the 45-35 win at Dugger Gym. Grady Morgan led all Laguna players with 12 points. This past week the Breakers traveled to Costa Mesa (6-13) on Wednesday, Jan. 18, and are at Estancia (7-9) on Friday, Jan. 20. Laguna played tough, but were unable to get past two of the better league teams. Last week opened with Calvary defeating Laguna 41-35 on Tuesday, Jan. 20, and Godinez winning 55-45 on Wednesday, Jan. 11. Laura Nolan scored 19 against the Eagles and 17 against the Grizzlies.